Jeremy had recieved a pair of new proto-Type shoes to put on Honor for the NAETC. Honor had been having some tenderness issues and this new product was what we believed would make the difference. A few days after applying them Honor felt like a totally different horse. We were VERY excited!! We got out of there for another long day to Iowa to stop at the Olson's for the weekend. We arrived on Friday. It was great to get out of the truck for a few days. The horses were happy too. We got everything all organized and cleaned up. Then it was time to shut down and rest. We went out to eat at a local place and it was delicious. On Saturday we went out on the Mississippi River in the Olson's boat. It was a lazy day on the river. We beached it and floated in the water with all of the other locals. At one point Jeremy Reynolds and I decided to swim down the river to the end of the beach, with the current and then walk back up to the boat along the beach. It was super fun, that is, until we had to walk back. The sand was SOOOO hot!! It took us a while to get back as we had to keep scrambling to the water to cool our burning feet off. The next day we had a relaxing day and went to see Mission Impossible. It was super, I loved it. It turned out to be a 14 hour North East drive. Oh well. Honor and Errow traveled well. I had decided to let Jeremy ride Honor at the North American Championship as he had not been able to do Tevis this year. I would ride Errow. When we arrived it was late afternoon Tuesday. We got everything all set up and turned the horses out in a grass pen. The weather was hot and humid. We went to the Team house that night for dinner and real showers. It was great to see everyone and visit. Lynn Kennelly had just been at Tevis so we were spoiled to get to see her again so soon:) She made an awesome meal as usual. Straight back to camp for after dinner and we fell asleep right away again. This was the last race on our summer road trip. Things felt good. The next several days are a blur of preparing the vet area, vetting, checking in and hanging out. It rained most of thursday. Thursday night there was a dinner and a ride meeting and then off to bed. Friday was the ride day. Friday morning Errow was a pro at the start, very nice and calm. He even grazed some. Honor on the other hand was ready for them to say "GO". The start was uneventful. Errow trotted and cantered around to the trot by and looked fabulous. The trail was very technical, the saving grace was that it had soft footing beneath the rocks, roots, ruts and erosion. There was also much more hill than anticipated. Unfortunately after the first 22 miles I was out. Errow had done something and was lame. He was great coming in and not great trotting down the lane. Bummer. As soon as I was done icing and taking care of Errow, I became crew. Honor was rolling along nicely. He was in the second group most of the race. On the second to the last loop he had closed his gap on the first horse to 2 mins. Leaving on the last loop he looked incredible. He caught up to Meg on the last loop. Meg and Jeremy rode along and had even decided where they would race off (the finish was not a very safe one for racing) then Jeremy said with a mile to go Honor did something weird. Jeremy asked for a canter and Honor got wobbly feeling. Jeremy thought maybe he was cross cantering so he asked him to trot and went to canter again and it happened again. It was too weird so Jeremy decided to get off and run. Meg won the race with Honor coming in second. The only thing Jeremy could figure was that Honor may have gotten too hot. He recovered well at the finish and looked great. Better safe than sorry!! Especially when it's your wife's favorite horse!! The new Easycare Proto _type shoe made all of the difference between being able to do this race or not, and Honor not only did the race but won a silver medal. Thank you Easycare and especially Garrett and Curtis. In all, Canada was a lot of fun. Meg won BC the next day. Oh and Errow was sound about 3 hours after we pulled him! The awards brunch was the best I've ever seen at any race. We stayed until early Sunday morning to head home, as we wanted the horses to rest. There was a very fun chili feast on Saturday night with music and dancing. Good times. We got back to the Olson's on Sunday night, in time for a delicious Spaghetti bake to celebrate Ellen's parent's anniversary. The two horses we left were happy to see their friends return. We stayed at the Olson's until Tuesday. We went for a fun ride through their back hillside trails. It was very fun. I rode the Olson's Vagas and Jeremy Reynolds rode his new horse Danire. The drive home from the Olson's was going to be a 2 day drive but the magnetic pull was too strong. We kept the wheels rolling. It was great to finally be back home. It was over 10,000 miles of driving from the time we left. We left in late May and drove to the Olson's in Iowa, Fort Howes, Durango CO, Licoln CA, (flew to Vermont for Jeremy's 100 mile run) back to CA, Iowa, Canada, Iowa, Florida. It was so great seeing everyone along the way. We got home Aug 26th. Our place in FL was like a jungle from all of the summer rain. The horses here at home were really happy to see us but our friend Lori Schifflet took great care of them while we were away. Our next ride will be Big South Fork, hope to see you there. Tevis was great up until when it wasn't. My day started off perfectly with King behaving himself very well. He trotted along. 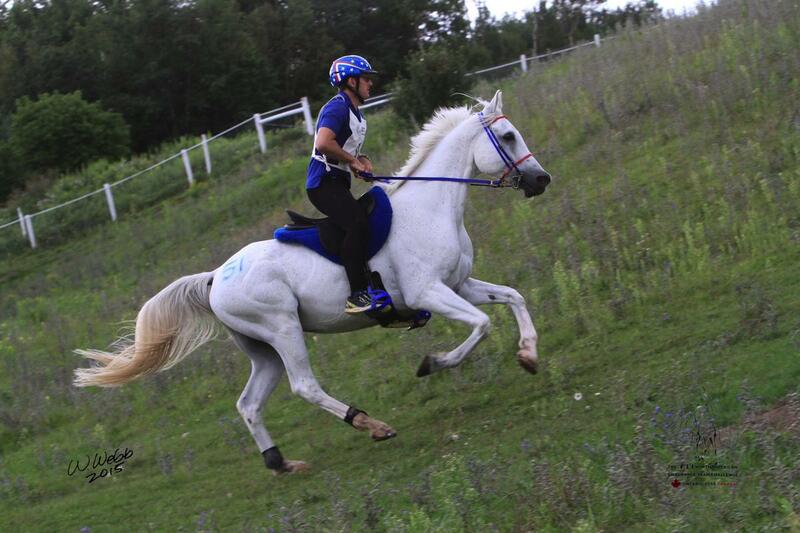 King doesn't have a very fast trot as he is more of a cantering horse. The trot pace in general for the morning was around 10 mph, King is really comfortable around 8.5. My choices were trot faster than he goes naturally or canter bouncing around on a horse that was worried he was being left. I opted for the trot. I didn't feel the trot was so big that I was risking a strain or anything like that but it was bigger than ideal for King. I was lucky that when I got to Granite Cheif I was in front of my group so I got to take my time through this section. King was a perfect gentleman. I did cause a bit of traffic by the end of it as many people were choosing to go faster through that rough section than I wanted to go. Just after the Wilderness area the trail opens up and the Cavalry charged on past us. It turned in to total mayhem for several miles. People were passing by galloping down steep, REALLY rocky sections. Impressive...not in a good way. At Red Star ridge King came down very quickly so we passed the majority of the Mad Dash riders. The trot down the boring road into Robinson passed by. At Robinson Flat my crew tried to hand me jugs of water filled with to pour on my horse. King was convinced he was literally going to be killed by these so I had to drop the jug before he almost ran over the crowd. When the jug hit the ground he did a spectacular leap...again the wrong type of impressive!! King ate well at this check and for the second year in a row I had a recheck on my blood work. I would love to see what it is they are seeing. When I went back for my recheck the vet admitted that most of the top horses that were in, were all getting rechecked and that they all looked great. The weather at Robinson was really weird too. It rained on us and got chilly enough that I wrapped myself up in a blanket. King and I headed back on down the trail. He felt good. Somewhere along the Pucker Point trail there was a tree down that made life REALLY interesting. We had to scramble up and around the tree on a very tall, steep mountainside and then drop back down onto the single track. King was not sure I was seriously asking him to do that! Luckily for the riders behind us the tree was moved by a rider in the next group back, I hadn't been manly enough to heave it out of the way. The canyons were hot as usual and a little humid (by Florida standards it was dry). King was happy to get cooled off at Michigan Bluff. My entire crew was super!! Then we were off to Chicken Hawk. At Chicken Hawk we cooled him again and let him eat a while. When we had stayed long enough we headed to Foresthill. King was surprised to see all of those people there. He is a skeptical kind of guy. I went and took a shower while King ate really well there. When our hold was up I had my crew ask the out timer how far ahead the next two were and also how far ahead Potato was. Gwen and Dace were 7 minutes ahead and Potato was 28 mins ahead. King looked good as we left through town. I was happy, as I knew that the California Trail would offer some spots to move out and let King finally canter some. About 4 miles into the loop I caught Gwen and Dace who were doing an easy jog. I decided to go around and continue on my pace King was doing as he was moving effortlessly. That section was pretty warm. The horses were working. Just before Francisco's we caught Potato. King had pulled us up to the front. I backed off and let the three others pull away in to the Francisco's check. King looked ok but was starting to look a bit worn. I cooled him out and let him eat for a while. Dace and Potato raced out of there. After King ate for a bit we vetted and left. Gwen and I rode together from this point to the quarry. The river crossing was deep and chilly. At the Quarry I cooled King down and then vetted him. He wasn't right. He had felt fine on trail but now had a hind end issue. After looking at him for a bit I made the tough choice to rider option. In hindsite I am pretty sure it was all of the big trotting combined with the amount of hill effort involved that finally caught up with King. The good news is that he was sound on Sunday. He is such an amazing horse. I really enjoy him. I want to thank all of my amazing crew that I had that day, my husband, the Shackelford's for putting us and our four horses up for the summer and to King for taking me on an amazing 94 mile ride. From here we went to Canada! !